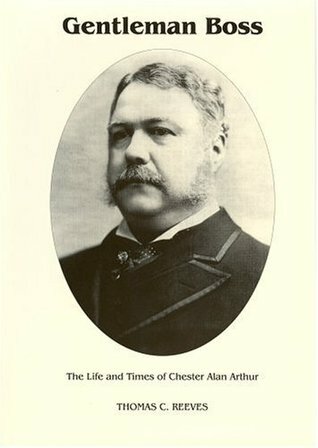 “Gentleman Boss: The Life and Times of Chester Alan Arthur” by Thomas Reeves was published in 1975 and immediately became the definitive study of the 21st president. Reeves was a senior fellow at the Wisconsin Policy Research Institute and a professor of history at the University of Wisconsin. He is the author of nearly a dozen books. Because Arthur ordered the destruction of most of his personal papers just before his death, researching his life is regrettably difficult for a biographer. Reeves seems to have overcome this handicap with remarkably diligent and thorough research. As a result, this comprehensive biography is a treasure trove of historical nuggets and seems certain to remain the definitive reference on Arthur for the foreseeable future. History remembers Arthur as an accidental president of only average consequence, but Reeves is able to dissect his life – and presidency – in a way that demonstrates his complexity both as a person and as a politician. With remarkable balance and objectivity, Reeves paints the portrait of a man who underwent a dramatic transformation from a “spoils-hungry” party hack to an unexpectedly honest and respectable president. Although the book is broad in scope, Arthur’s early life is covered quite quickly. But after Arthur begins work as a lawyer and later finds himself in his first patronage job (on the military staff of New York’s governor during the Civil War) coverage of his life grows more thorough and detailed. And when the forty-one year old Arthur is appointed to the nation’s preeminent patronage position (Collector of the Port of New York) the book is at full stride. Reeves’s description of the inner-workings of the New York Customhouse, where Arthur would spend nearly a decade before being removed by President Hayes, is excellent. And the author’s survey of the Republican National Convention (where Arthur was nominated for the vice presidency) was thorough and engaging – though not quite as colorful as Kenneth Ackerman’s depiction of the event in his book on James Garfield. The Arthur presidency represents the core of the book, if not always its most exciting chapters. But by the time Reeves begins his methodical (and occasionally exhausting) coverage of Arthur’s tenure as president it is already clear this is destined to be the definitive book on the life of Chester Arthur. The biography’s final chapter – dedicated to reviewing Arthur’s life and presidential legacy – may be its best. As meritorious as this biography proves to be from a historical perspective, it is not perfect for readers seeking a uniformly carefree and entertaining reading experience. While much of the book is engaging and provocative, some portions are dry, tedious and dull. Chapters covering foreign affairs, in particular, require healthy doses of fortitude and patience. In addition, although Reeves provides excellent historical context beginning with the Grant administration, far less context is provided during Arthur’s early life. This makes it relatively difficult to anchor his childhood to memorable or familiar moments in the nation’s history. Finally, Reeves occasionally dives deeply into matters that seem tangential to all but the most committed of historians. As just one example, Reeves maintains a keen focus on New York state politics even after Arthur leaves the state to become Vice President. While this leaves a valuable research trail for some readers, it is probably distracting for most. Overall, however, Reeves’s biography seems a far better study than Arthur – or his era – probably deserves. Though not always entertaining, it is consistently thoughtful, balanced and insightful. For readers who survive the early, less penetrating, chapters the book grows steadily more compelling. And for its contribution to understanding the life and presidency of Chester Arthur this biography deserves nearly a perfect score.